Mango butter is extracted from the kernels of the mango. Shelf Life: 1-2 years if stored at room temperature out of direct light. Mango butter is extracted from the shelled fruit kernel of the mango tree, which is a tropical evergreen. This butter is highly emollient, softening and soothing to the skin. Mango butter has protective effects against UV radiation and also helps treat skin rash, eczema, insect bites, and poison ivy. Mango butter can help protect and heal skin from the damage caused by sunburn and frostbite. 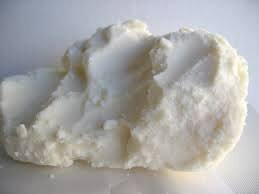 While mango butter is excellent for skin, it is often mixed with other ingredients because it is quite hard. It is commonly used in soap making, skin care, and hair care products. Mango butter is rich in antioxidants, vitamin A and E.
This may be a premature review but I couldn't wait! I ordered 8oz of mango butter and 4oz of kokum. I have yet to use either item as it only came in the mail today and but I just want to say I love how carefully my products were packaged. Not only are the tubs of butter in their own separate, Ziploc bags, but they're also taped shut and snuggled among packing peanuts. Each butter smells and feels great upon first touch. Also, I'm excited about the two samples I received, dead sea salt scrub and Aquolina pink sugar wax melt, which smells divine. And, I must say, the bag of Halloween candy is a very cute touch. Thank you!! Can't wait to use the butters! I haven't used this yet, but it looks great. Happy w/my order(s), the seller shipped fast & made sure everything was well protected. I really appreciate the candy and the Blackberry Orange Linen/Body spray sample. This smells great! Just by the name, I don't think I would've ordered it, but glad you enlightened me on how good it smells :) Now I just might have to include it in my next order! Thank you! Love it can't wait to use it!